Ferns are ancient plants that reproduce by generating and spreading spores, much like fungi and mushrooms. Boston fern, also known as sword fern, is a dependable plant with masses of long, graceful fronds. One might also notice root nodules on Boston fern plants. Highly valued as an indoor plant, Boston fern thrives in pots or hanging baskets. In warm climates where temperatures are consistently above 50 F. (10 C.), the fern is easily grown outdoors. If you ever repot or transplant a mature Boston fern, you may notice balls on roots of ferns. These balls, which develop where the fronds meet the underground rhizomes, are small, round growth nodules about the size of a grape. The nodules, also known as “bulbils,” usually appear near the end of the growing season, between late summer and autumn. Are Balls on Boston Fern Roots Harmful? Root nodules on Boston ferns aren’t harmful. 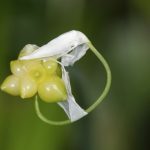 They are a natural adaptation that ensures the plant’s survival. Boston fern nodules help the plant take up moisture and nutrients in the soil. They are important because they store water for the plant during periods of drought. Boston fern is often propagated by dividing a mature plant or by planting small plantlets that grow amidst the larger fronds. You can also propagate the plant by planting the root nodules. 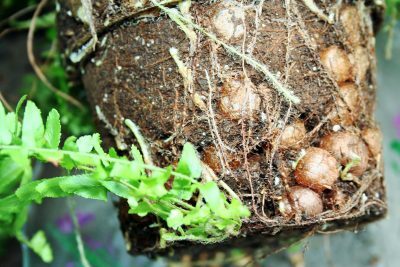 Plant a small section of rhizome with attached root nodules in a pot filled with moist potting soil or equal parts sand and peat. A rhizome with at least three nodules is more likely to root. Sometimes, you can successfully propagate an old, dead fern by planting nodules, which may be fleshy and green even if the main plant is dry and shriveled. Plant the nodules in a pot with the green growth facing upward, just above the surface of sterile potting mix. Place the pot in a plastic bag and fill the bag with air. Place the pot in indirect light and temperatures between 59 and 68 F. (15 to 20 C.). With any luck, you’ll notice small, white nodules in one to three months. When the nodules develop roots, remove the plastic bag and plant each rooted nodule in its own pot. Moisten the potting soil, then place each pot in a plastic bag to create a greenhouse-like environment. 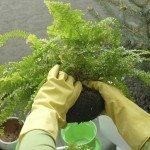 Allow the new fern to mature, then remove the bag and plant it in a larger container, or out in the garden.